First articles have been seen on various parts and things are looking good. The Keel parts are being stress relieved before final machining happens. The handle cranks have been ordered. These things are made in Italy of all places. They need to up their espresso intake because they have very long lead times! Yay! All the handles are here. Lots of parts at the anodizer now. Hardware kits ordered and being packaged. September delivery is on track. I picked up the Front and Rear shafts today. I need to get the gears pressed on with the bearing blocks. Since John is done with the CT-17’s, maybe I’ll have him do it! I found a new shop to make our stands. This is now one stop shopping for me, which is great! Prior to this, I had 4 vendors to deal with and had to schlep the not-so-lightweight parts between them all. My truck will thank me! Anodizing is completed on some parts. 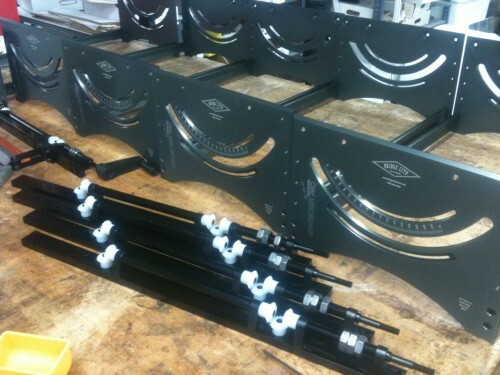 The Front and Rear Plates were dropped off at our Laser Guru this week. He has the task of ensuring the angle grads are in the proper place. Laser etching aluminum is a fascinating process. The laser eats through the anodize color of the aluminum revealing the raw aluminum underneath. The raw aluminum appears white, which is perfect for most of the anodized colors out there. A laser etch on aluminum will not scratch, flake, or peel off. The only way it will wear off is if the actual aluminum is worn away. Things should be very close to total completion by the end of the month. I am thinking that units may not actually head out the door until the very end of the month, or the first part of October. 9/15/11 – What a week for the Jointmaker! Lots of parts came in. I assembled a complete drive train today and all is looking good. We are bringing 5 units to the WIA show so I’ve got to get these 5 all assembled for the show. After all of the packaging, all should ship out by second week of October. 9/22/11 – I shipped out the 5 Jointmakers to the WIA show. They went together perfectly too. We are very excited about this batch! The chrome plated steel rods are quite the bear. These rods are induction hardened and are very hard! Getting the right tools to cut these is tough. We rough cut them with an abrasive saw, then put them in a milling machine to cut them to the precise length that we need. A lot of endmills were used in the process. Mid October delivery is still looking good. 9/29/11 – Full steam ahead now. The rods are just about completely cut now. They are being shipped to another facility to be straightened to within .001″. Linear travel mechanisms need to be very precise. The Jointmaker requires a motion that is very accurate, without any slop. Sub assembling of the gears, shafts, and keel starts Monday. Hardware kits are being assembled currently too. Packaging materials will be delivered on Wednesday. Phew, this thing has lots of parts! We are going to crank these things out and the plan is to start shipping by the 14th. 10/6/11 – Looking good here! The first orders will start shipping out on the 14th. We are going to send some out everyday after that. All orders should be fulfilled by the end of the month. 10/13/11 – We have been packaging up all of the parts this week. There is more order to the parts with this batch. There are 6 hardware bags in the JMPv2 kit. In the instructions, it tells you when to open each bag. This way you do not have a big pile of parts to sort through to assemble the JMPv2. So those of you who open everything and take inventory of the parts before assembly, I would try and refrain from that compulsive habit this time! Credit cards will start to be processed tomorrow, and shipping will start up on Monday. If you have one on order, we may be contacting you for an updated credit card number. 10/20/11 – We shipped out a boatload this week. Well, actually, the international orders may go by boat, but I doubt the units going to Colorado will..The UPS man got his work out as he loaded up the truck this week. You think those guys bother going to the gym after work? We still have a bunch more to get out before we attack the waitlist. I am hoping to get to the waitlist people in the first week on November after the others ship out. 11/17/11 – JMP Conversion kits ship out starting Tuesday the 22nd. 12/1/11 – This years edition of the Jointmaker Pro has just about come to a close. The last few remaining units are accounted for. We’ll be opening the Jointmaker Pro for Pre-Orders again in January. Let us know if you would like to add your name to the list. Re: Bagging the parts in order of assembly..very smart. I’m excited now, getting closer! Back when I ordered the JMP I wanted to order spare blades — If I remember correctly the recommendation was to order them separately during the time of shipping the JMP. Do I need to launch a separate order now? Thanks. If you would like more JMP blades you should give us a ring to place the order. What are features of JMPv2s? When is anticipated delivery and how is a pre order placed? We should be opening up the JMPv2 for Pre-Orders in January. Production should start in February with delivery in August. We currently have a substantial wait list for the JMPv2. Our traditional pre-order window is February for a Fall delivery. In our staff meeting this week we have decided to open the pre-order window in January for an August delivery. As far as changes to the JMPv2, there will be none with one possible exception–we may make the outboard trap clamps from extruded aluminum. We will offer a “Works” version that will include the Precision Fence System. Pricing as of this writing will be about the same as last year, but our final production quotes are not in for 2012 yet. Terms will be the same as the previous three runs, 50% down, 50% on delivery. As long as your email address is on file (you can click the “Notify Me” button on the JMP page to add to the list) we will send you an email when the pre-order window opens. Darn, it looks like I missed the last batch of JMP conversion kits. Is there any chance you’ll do another run, or should I just throw this thing out and order a v2? Also, is the Precision Fence System compatible with the original JMP or just the v2? We will be opening the pre-order window for the 2012 JMP v2 run in January,2012 for a July-Aug delivery. We will also make more conversion kits at that time. The Precision Fence System does not fit the original JMP, but does if a conversion kit is installed. The reason is that the bearing blocks in the conversion kit span the two long bolt slots, making the tables able to withstand the clamping pressure of the fence system. John, I just got the email stating that there’s only a week left to place pre-orders on the JMP v2 and the Precision Fence. But it doesn’t look like the JMP conversion kit is open for pre-orders. If I’m able to order the conversion kit, I will order that and possibly the fence. But I don’t want to order the fence if the conversion kit will not be run. Please let me know if it that will be an option. Thank you.